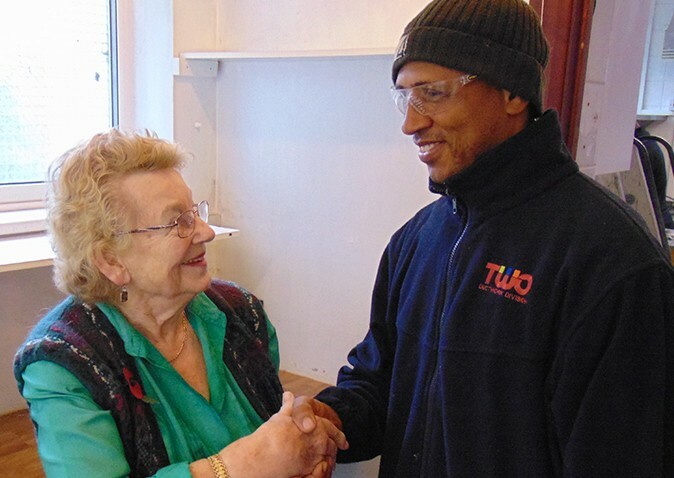 As part of our desire to give something back to the local community, TWO Services are proudly supporting the Canvey Island Senior Citizens Association (CISCA) by providing two kitchen deep cleans per year, free of charge. This reduction in CISCA’s operational expenses will have wide ranging benefits to the patrons as, with the rising costs of providing nutritious meals on a daily basis, the total kitchen expenses will be greatly reduced, alleviating the need to raise meal prices. At the same time it will also provide a significant contribution towards the very high heating costs. CISCA House, in the Paddocks area of Long Road, was founded 47 years ago by Harry Whitcomb, as an extension of the Canvey Island Christmas Parcel scheme. He recognised the need for a centre that was completely open to all – unaffiliated to any particular race, class or religion. Today the centre is frequented by nearly 50 men and women per day, who come to enjoy hot meals and warm company. The oldest current patron is 98 and the youngest is 65 (although anyone over 55 is welcome). Loneliness and feelings of isolation can be a real problem for the elderly, with recent statistics showing that 17% of older people are in contact with friends, family or neighbours less than once a week, while over half of all people aged 75+ live alone. Sadly, almost 5 million older people state TV as their main form of company. With this is mind, especially as the festive season approaches, volunteer organisations such as CISCA provide invaluable life lines and socialising opportunities for those looking to fill what can otherwise prove to be very long, lonely days. Co-Chair Mary Greenhalgh, who got involved with CISCA five years ago when her husband Michael volunteered to be treasurer, explains that aside from the social aspect, the canteen is their most vital service and so maintaining affordable prices is critical. She has seen a recent increase in the number of people visiting on a daily basis – a sign that many local elderly are finding it hard to manage food and fuel bills. Run entirely by a small army of between 60 and 70 volunteers, the centre is open Monday to Friday, from 9am. With its modest prices, the kitchen is kept understandably busy serving cooked breakfasts, sandwiches & rolls and hearty main meals with a dessert, for just £3.20. For nominal fees, there are a range of activities to participate in, the proceeds of which go towards providing funds for the centre, including bingo twice a week, quizzes, raffles, short mat bowls in the evening and snooker at 50p a time. There are several coach trips and social evenings per year, including one to say thank you to the volunteers that CISCA depends upon. Patrons also do their bit to support other charities through various craft activities, including knitting blankets and hats for premature babies at local hospitals. Aside from good food, warmth and company, patrons benefit from being able to access help and support with filling in forms and accessing services, as well as regular talks on a variety of topics.